"Isabella of Armenia" redirects here. For other uses, see Isabella of Armenia (disambiguation). 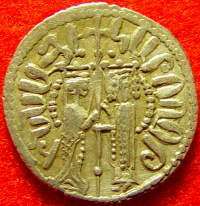 Isabella I (Armenian: Զապել), also Isabel I or Zabel I, ( 27 January 1216/ 25 January 1217 – 23 January 1252) was the queen regnant of Cilician Armenia (1219–1252). She was proclaimed queen under the regency of Adam of Baghras. But he was assassinated; and Constantine of Baberon (of the Hethumian family) was nominated as guardian. At this juncture, Raymond-Roupen, grandson of Roupen III (the elder brother of Isabella’s father, King Leo I) set up a claim to the throne of Cilician Armenia; but he was defeated, captured, and executed. Constantine of Barbaron was soon convinced to seek an alliance with Prince Bohemond IV of Antioch, and he arranged a marriage between the young princess and Philip, a son of Bohemond IV. Philip, however, offended the Armenians’ sensibilities, and even despoiled the royal palace, sending the royal crown to Antioch; therefore, he was confined in a prison in Sis (now Kozan in Turkey), where he died, presumably poisoned. The unhappy young Isabella was forced to marry Constantine of Barbaron’s son, Hethum; although for many years she refused to live with him, but in the end she relented. The apparent unification in marriage of the two principal dynastic forces of Cilicia (i.e., the Roupenids and the Hethumids) ended a century of dynastic and territorial rivalry and brought the Hethumids to the forefront of political dominance in Cilician Armenia. The lawful heiress of the empire, Isabella, governed the country together with her husband, and led a pious, religious life. She was blessed for her good deeds and exemplary life by many children, the numerous offsprings of a famous race. Isabella was the only child of King Leo I by his second wife, Sybille of Cyprus. She was betrothed to Andrew, the third son of King Andrew II of Hungary in 1218, but the betrothal later broken in favor of a more advantageous Russian marriage of her bridegroom. King Leo I died on May, 1219. On his death-bed, he named Isabella as his heiress; and released the barons from their oath of allegiance to his great-nephew, Raymond-Roupen. But the claim of his five-year-old daughter was contested by Raymond-Roupen and by John of Brienne. 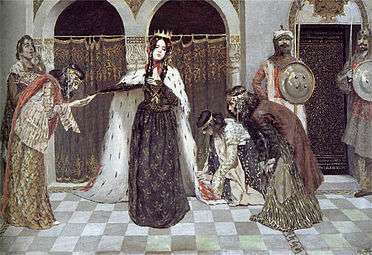 Isabella emerged as the favourite of the ruling Armenian nobles and thus she was proclaimed queen by acclamation and placed under the regency of Adam of Baghras. But Adam of Baghras was murdered after a few months; and the regency passed to the only remaining influential Armenian house, that of the Hethumian family whose head was Constantine of Barbaron. John of Brienne’s claim was based on his marriage to Leo I’s older daughter Rita (Stephanie). Pope Honorius III recognized John of Brienne’s claim that his wife or her son should succeed. John of Brienne received the Pope’s permission to leave the Crusade and visit Cilician Armenia in February, 1220. But as he prepared to sail for Cilicia his Armenian wife died; and when their small son died a few weeks later, John of Brienne had no further claim on the Armenian throne. Raymond-Roupen laid claim to the throne by virtue of lineage through his mother Alice, the niece of King Leo I. Moreover, he had long been considered as King Leo I’s heir. Raymond-Roupen approached the crusaders at Damietta in 1219 for support in claiming Cilician Armenia, and was able to return in 1221 with some of them and promises from the Papal legate Pelagius. Raymond-Roupen found some Armenian support in and around Tarsus, notably Vahram, the castellan of Corycus. Together they conquered from Tarsus to Adana, but then met reverses and were forced to retire to Tarsus where Raymond-Roupen was captured and ended his days in prison in 1222; his infant daughters retired with their mother to Cyprus. This event left Isabella the sole and largely incontestable heir to her father’s throne. Cilician Armenia, weakened by wars and in need of strong ally, found a temporary solution in a tie with the Principality of Antioch: the regent suggested that Prince Bohemond IV should send his fourth son, Philip, to marry Isabella, insisting only that the bridegroom should join the separated Armenian Church. Philip agreed to adopt the Armenian faith, communion and customs and to respect the privileges of all nations in Cilician Armenia. Philip married Isabella at Sis in June 1222 and was accepted as prince-consort. The joint rule of Isabella and Philip was brief; Philip’s disdain for the Armenian ritual, which he had promised to respect, and his marked favoritism to the Latin barons angered the Armenian nobility. Philip spent as much time as possible in Antioch. When it was rumored that Philip wanted to give the crown and throne to Antioch, Constantine of Barbaron led a revolt at the end of 1224. Philip and Isabella were seized at Tall Hamdun (today Toprakkale in Turkey) on their way to Antioch and taken back to Sis, where Philip was imprisoned and probably poisoned at the beginning of 1225. On the death of her husband, Isabella decided to embrace monastic life and fled to Silifke Castle. She sought refuge with the Hospitallers. The latter were unwilling to give her up to Constantine of Barbaron, but feared the powerful regent; they eased their conscience by selling him the fortress with Isabella in it. Bohemond IV, in anger, was determined on war, although such a conflict had been expressly forbidden by the pope as harmful for all Christendom. Bohemond IV called in as ally the sultan at Iconium, Kai-Qobad I, and ravaged upper Cilicia in 1225. Constantine of Barbaron arranged for the regent of Aleppo, Toghril, to advance on Antioch. When the latter attacked Baghras, Bohemond IV had to return to his own lands. Isabella was forced into marriage with Constantine of Barbaron’s son who was subsequently crowned King Hetum I in Tarsus in June 1226. She is said to have refused to consummate the marriage for several years. In the year 675 AE /1226/ the Armenian princes, together with the Catholicos, Lord Constantine, assembled and enthroned Hethum, son of Constantine, bailli of the Armenians, and also gave him /as a wife/ Isabel, King Leo’s daughter. Thereafter there was peace in the House of the Armenians, and year by year they strived for the heights. Constantine of Barbaron now thought it wise to reconcile Armenia with the Papacy: loyal messengers were sent in the name of the young couple to the Pope and to the Emperor Frederick II. Although Bohemond IV and later his son, Bohemond V attempted to persuade the Pope to arrange a divorce between Isabella and Hethum, but both he and King Henry I of Cyprus were specifically forbidden by Rome to attack the Armenians. The marriage was legalized by Rome in 1237. There is evidence that Isabella shared a degree of royal power, for we learn from several sources that she co-signed with her husband an official deed transferring to the Knights of the Teutonic Order the strategic castle and town of Haronie. The queen being near the end of her life, and staying in a place called Ked, she heard a voice from heaven, crying aloud, «come my dove, come my love, thy end is near.» She felt joyful on this happy vision, imparted it to the bystanders, and died in the Lord; her body was brought to the grave by a large assembly of the priesthood and laid in consecrated earth. She was buried in the monastery of Trazarg. 1 2 3 4 5 6 7 8 9 10 11 12 13 14 15 Runciman, Steven. A History of the Crusades – Volume III. : The Kingdom of Acre and the Later Crusades. 1 2 3 4 5 6 7 8 9 10 Ghazarian, Jacob G. The Armenian Kingdom in Cilicia during the Crusades: The Integration of Cilician Armenians with the Latins (1080–1393). 1 2 3 4 5 6 7 8 9 10 11 12 13 14 15 Nickerson Hardwicke, Mary. The Crusader States, 1192–1243. 1 2 3 4 5 6 Nersessian, Sirarpie Der. The Kingdom of Cilician Armenia. 1 2 3 4 5 Vahan M. Kurkjian (2005-04-05). "A History of Armenia". Website. Bill Thayer. Retrieved 2009-07-25. 1 2 Vahram (2008-09-10). "Chronicle". Text Archive. Internet Archive. Retrieved 2009-07-26. 1 2 Edwards, Robert W. The Fortifications of Armenian Cilicia: Dumbarton Oaks Studies XXIII. pp. 143, 147 note 4, 224, 229 note 14, 252, note 15. ↑ Smbat Sparapet (Sempad the Constable) (2005). "Chronicle". History Workshop: Armenian Historical Sources of the 5th–15th Centuries (Selected Works). Robert Bedrosian’s Homepage. Retrieved 2009-07-26. 1 2 3 4 5 6 7 Charles Cawley (2009-04-01). "Kings of Armenia (Cilician Armenia) (Family of Hethum)". Medieval Lands. Foundation of Medieval Genealogy. Retrieved 2009-07-26.